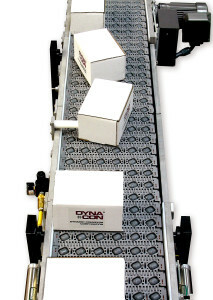 Case turning conveyors ensure a complete package or case turn every time — even if the conveyor is stopped and restarted in the middle of the cycle. And just like all of our conveyors, our case and box turning conveyors have a 5 year warranty, and can be custom designed to your specifications. Contact us today to request a quote, or have a representative conduct a free on-site visit to make recommendations for the best conveyor solutions for your facility.